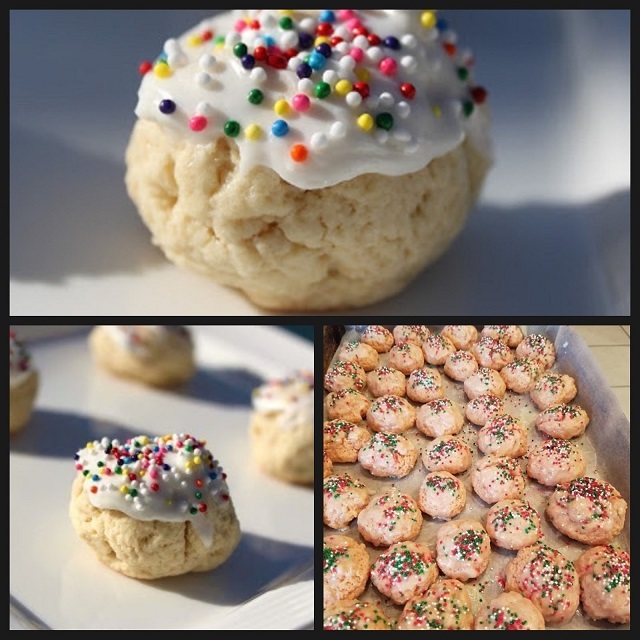 Grandma's Soft Italian Wedding Cookies also called genetti, are a soft cookie made in a drop form all shaped. Mom's and Grandma's special recipe handed down from generation to generation. You will often find these soft frosted cookies on large trays at Italian weddings and other Italian functions. This is a very versatile dough. You can flavor them with whatever you like. I love to tint them at Christmas in green or pink for the holiday. One of the traditions for an Italian wedding is to have a sweet tray and dessert table at the reception. 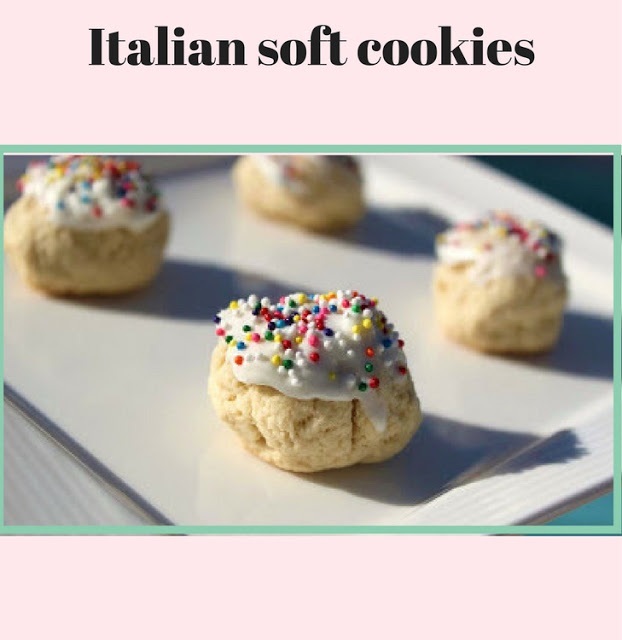 These soft Italian cookies are just one of the many cookies that are on that Italian wedding cookie tray. The cookie tray is piled high with assorted cookies often with candy coated almonds and silver tinsel. Usually with anything from anisette, sesame, rum balls to amaretto cookies. These are just to name a few. These are a soft cookies with a lemon frosting and sprinkles. They can be left plain vanilla in flavor or use whatever flavoring your like to make this same dough in many different flavors for the tray. You can make them into rounds, twists, bows, whatever shape you like using a little flour in hand. These freeze well so that's the beauty of them making way ahead of time for the special event. Just frost them fresh or the frosting when thawing gets too sticky. Let them air dry and then package them. At the end of dinner reception, the bride and groom traditionally take the tray from table to table where the guests take some cookies. Most of the time the cookies where already in platefuls way before they start to pass them out. Those cookies are a special treat that most can't wait for! Some folks even take the cookies home to those who couldn't make the reception. The traditional way of decorating these is with nonpareils (little candy balls in different colors). I have done them various ways. Sometimes I grate fresh lemon peel on top of the lemon flavored cookies. If I make orange flavored cookies I grate fresh orange peel on them. Once in awhile if I make them maple flavored I sprinkle chopped walnuts on top. One of my fathers favorite was making them almond flavored with sliced toasted almonds on top. Even if you make them lemon flavored your can add coconut on top instead of lemon peel. I have made the same dough over and over with many variations. You will love this dough for the variety it can make. Then of course you can color them to the bridal party theme. The birthday party theme or whatever special event it going on. For my sons first child, knowing it was a boy, I made plain vanilla flavored cookies with blue icing and blue sugar crystals on top. They were perfect for the baby shower. As you can see the skies the limit and with your imagination and event, party, bake sale, whatever is going on, make it special. The 4th of July I made them with red, blue and white frosting. They were so festive for any holiday. For Christmas red and green and white as shown below. Lets get baking! 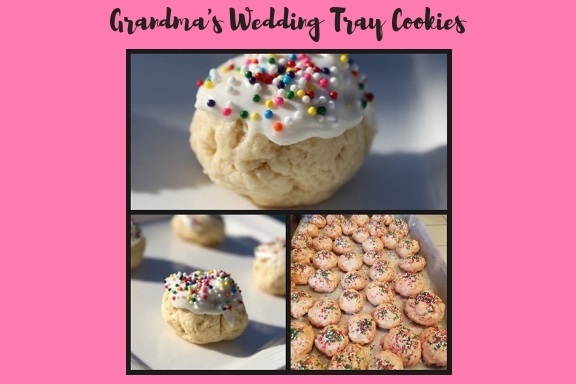 Have fun, these cookies are a sure winner and always a big hit! The recipe has been in the family over 100 years! Here is another example Cherry Coconut with almond flavoring in the photo below. Add chocolate chips, vanilla and coconut to the batter or change it up with coconut and lemon. These cookies are usually found on Italian Wedding Trays. Either flavored with lemon or Anisette. This is an Authentic Recipe from My Grandmother from Rome Italy that made these for every Italian wedding in the family, along with my mom and now me. Mix all ingredients in a bowl, drop on cookies sheets by teaspoons. Bake at 350 till brown around 8 to 12 minutes. The tops will look dry and the bottoms will be brown. Cool frost add colored sprinkles. Mix adding more water if this is too thick to spread, add more powdered sugar if it's too thin.. beat till smooth. My mom use to make these cookies and it was a favorite. Well done!! My mom too! And my grandmother! Did we grow up in the same neighborhood?! Ooooohhh love this !!! Can you fedex this to me!!! it's so nice that you're making these cookies from your childhood, I love doing that too, reminds me of happy times with my family. Yummy ! Thank you for sharing. Cheers ! 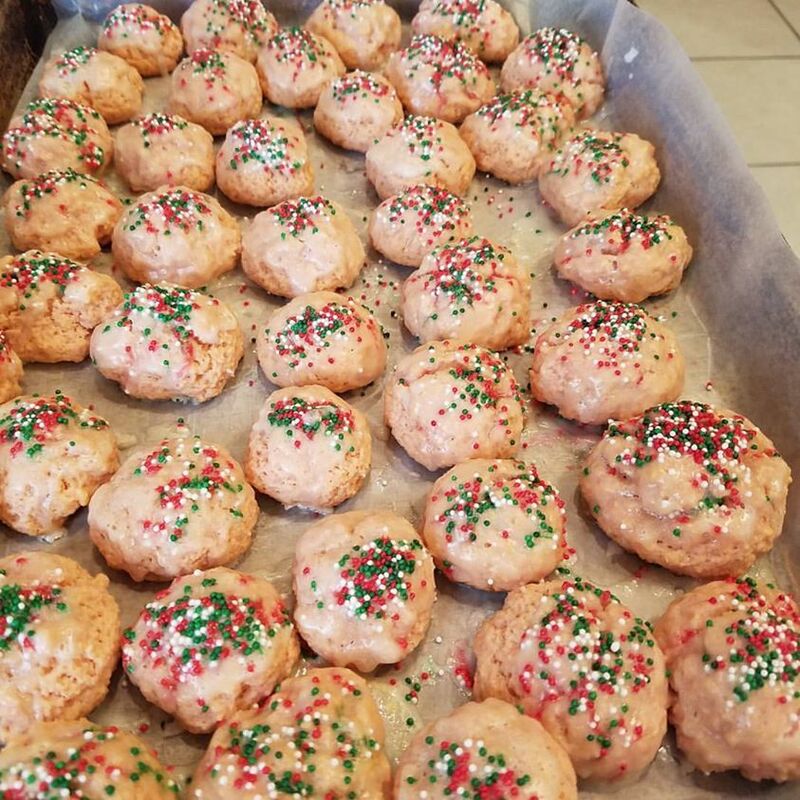 looks so good -we still make many italian cookies during christmas. my fav time of year! These cookies looks so soft and highly addictive! I like that you can flavor these anyway you want. I'd go almond! I have been asking everybody in my family for this recipe that my grandmother use to make--nobody has it! Thank you!!!! I have never come across anyone else with this recipe. My grandmother always made these with anise flavoring and taught me to make them when I was ten and I've been making them ever since. They are a family fave! Hi! I want to use these cookies for a school project but i need the nutritional info. Do you have it? Was 2 tablespoons of flavoring a mistake? I put in 1 Tbs. of anise and the smell was really strong so I didn't put in the second one. After tasting one, it was a bit too much flavoring I thought. Perhaps it should be 2 TEASPOONS of flavoring instead. These are too strong to give out on my cookie tray gifts but I'm hoping after putting on UNFLAVORED frosting these might be salvaged. I have an old recipe similar to this however, I've trashed it and plan to bake these soon. This is an all time favorite cookie of mine. Thanks ever so much for sharing your families wonderful recipe. I look forward to future recipes. hope you love them as much as we do its a family favorite. I always have to make all vanilla or lemon here. Enjoy Patty! I'm familiar with Italian wedding soup but not the cookies. interesting to learn about the traditions surrounding them. Love the tradition behind these cookies. 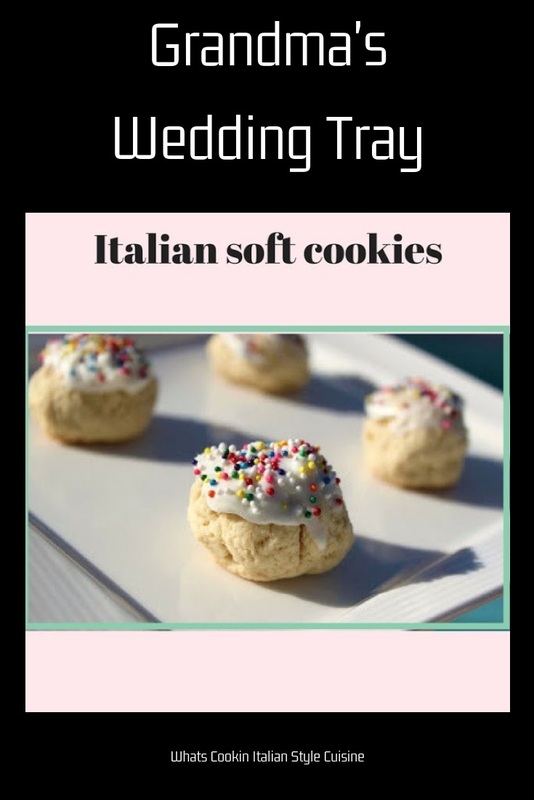 Italian wedding cookies! I love the name. These look so soft and gooey. Trying them right away!